With a 5-inch 720p screen, quad-core processor, strong battery life and excellent camera the Lumia 640 is Windows Phone's answer to the Moto G. For friends, family and everyone in general, you'd have real trouble doing better than this. The Microsoft Lumia 640 is among the first in a new breed of Windows Phones. With a larger screen, more RAM and a different design language from its predecessor, this is Microsoft stamping its logo (literally) on the Lumia range. And what a change this proves to be. The old Nokia did things a little differently. Budget devices made by the Finnish firm were notoriously bare-bones; this could be seen in the decision to omit Gorilla Glass and limit RAM in models such as the Lumia 520 and 630, among others. Value was added for the consumer through access to services such as MixRadio and HERE Maps. Microsoft takes something of a different tack. Those who purchase a Microsoft Lumia 640 will receive several sweeteners, such as 30GB of free OneDrive storage and a one-year subscription to Office 365. These in themselves are nice, especially for the price. However, when paired with a phone that rivals (and exceeds) the ever-popular Moto G in many areas, even in its newer incarnation, heads will start to turn. When it comes to specs, the Microsoft Lumia 640 does not disappoint. The device has a 5-inch, 720p screen with 294 PPI, a quad-core Snapdragon 400 processor clocked at 1.2 GHz, 1GB of RAM and 8GB of internal storage. These are exceptionally healthy specifications for the £130, $250 (around AU$320) SIM-free price point. Though these specifications might appear exceptional, the competition is quite fierce. Devices such as the Honor Holly, Moto G (2014) and EE Kestrel all offer unique advantages at the same price point, while also being able to access the more than one million apps available on the Google Play Store. As such, the question is, can an Office and OneDrive subscription sell the Microsoft Lumia 640? Will this be the budget hero device that Windows Phone needs? When I received the Microsoft Lumia 640, I was not especially impressed. My review device was constructed of a glossy cyan plastic, which was unpleasantly reminiscent of older Samsung devices. I don't have the greasiest fingers in the world, however after five minutes of using the Lumia 640, it looked as if I had wiped it with a pepperoni pizza. Luckily, the back cover of the device is removable, allowing you to switch in a number of different options, meaning (mercifully) that matte covers are available for those who might want them, along with other suitably 'Lumia' options, including black and orange. Coming from a smaller device, as I had, it took a little while before I was confident enough to use the phone one-handed. The glossy plastic back meant the phone had a tendency to skate across tables with reckless abandon, so a case might be a wise investment for some. Though well-balanced in the hand, the shell itself does not feel especially sturdy. Coming from a device such as the Lumia 435, which could sink a ship, the Lumia 640 LTE does not impress overly. Looking at the side of the device, the black of the inner portion was clearly visible through the plastic, looking as though it might crack easily were it to fall. Once the back has been removed, access is given to the Micro-SIM slot, the removable 2500mAh battery and the MicroSD slot, which takes cards up to 128GB in size. The sides of the Lumia 640 LTE are clean and uncluttered, and in the traditional Lumia fashion everything of note is thrown to the right of the phone. No sharp edges are to be found, and using this phone either one- or two-handed is a pleasant and comfortable experience. The power button and the volume rocker have a decent travel and a nice click to them, meaning everything is easy to find. A single Micro-USB slot is tidied away on the bottom of the device, while the ever so slightly roughly hewn 3.5mm headphone jack is on the top, as might be expected. On the back of the Lumia 640, there is a single rear-firing speaker, a neatly displayed Microsoft logo, a single LED flash and the 8MP rear-facing camera. The front of the device contains the 5-inch screen, a 0.9MP selfie camera and the usual additions of a call-speaker and microphone. With Gorilla Glass covering the front panel, the oleophobic coating immediately makes itself known, feeling very pleasant to the touch. Overall, this is a utilitarian but nice device for the price. 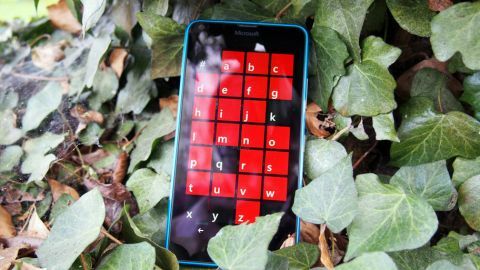 Though Microsoft doesn't take any great gambits with the design, the phone is light, well balanced and pleasant to use both one- and two-handed.